StP Hasso, Dannes, Pas-De-Calais. K.V.A. D1 Hardelot to Merlimont. Dépöt souterrain de Neufchatel, Sperrwaffen Kommando. Built to store sea mines and torpedoes for use on ships in the channel ports of Boulogne, Calais & Dunkerque. 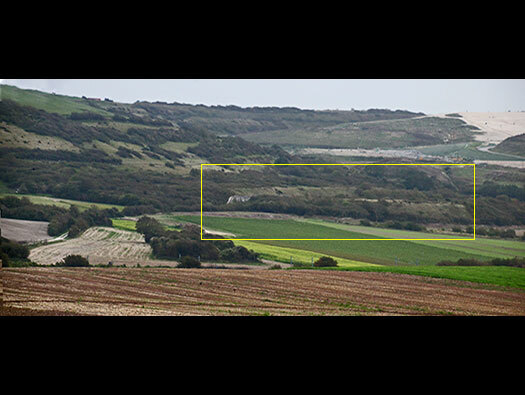 Situated to the east of Dannes near the Holcim cement plant which uses the limestone to produce cement. 'The announcement of Holcim France to stop the oven, so the manufacture of clinker to cement at Dannes will end.' looks like there are problems with the cement plant. View from across the valley. This is how it was to look with the finished tunnels showing and the proposed site beyond. 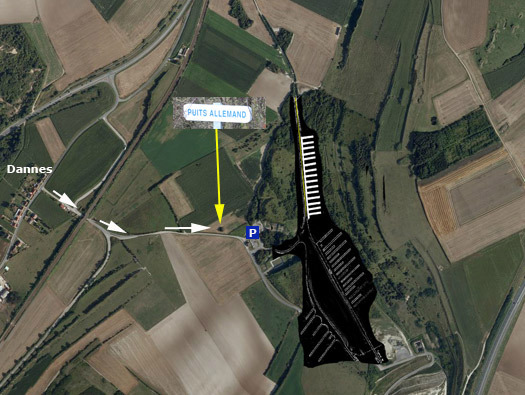 From the road to the chalk quarries you first pass a well with the sign "Puits Allemande" (more later) and park at the end of the road on the left by a gate. 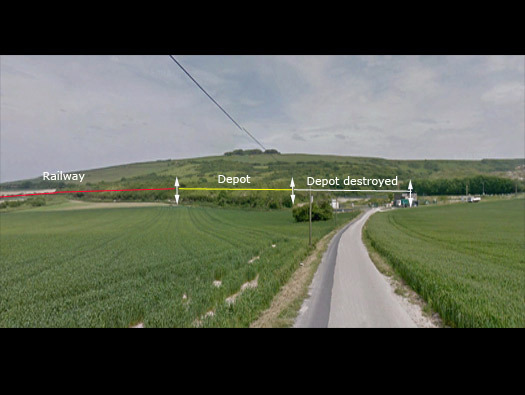 The depot was to consist of about 38 galleries and two railway tunnels to hide the train engines at times of allied bombing. As far as I can see 15 galleries were built or remain and the others were under construction or planned. Two areas of excessive damage. 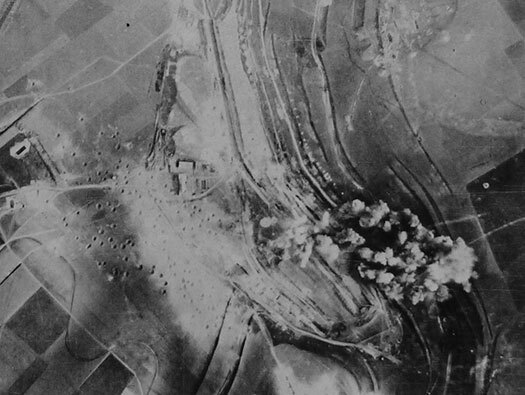 A 1943 bombing target air photo. 2 - Standard gauge railway. A day time raid probably by Lancaster bombers. SAV 323/403-16 Photo number. Neg. No.36933. 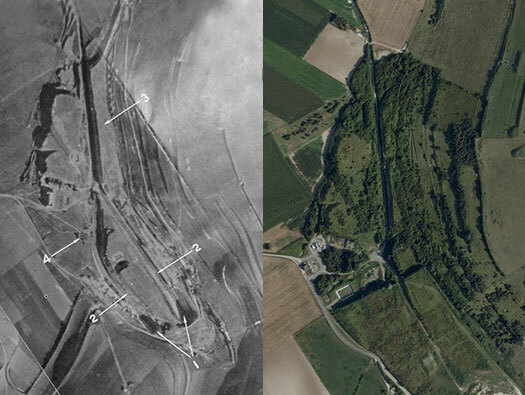 Into 1944 any targets that related to the future of D-day and also V weapons sites were attacked by allied bombers. The railway coming in off the main line, then the depot and then the depot that was either destroyed or not built or in the process of being constructed. The start of the depot. 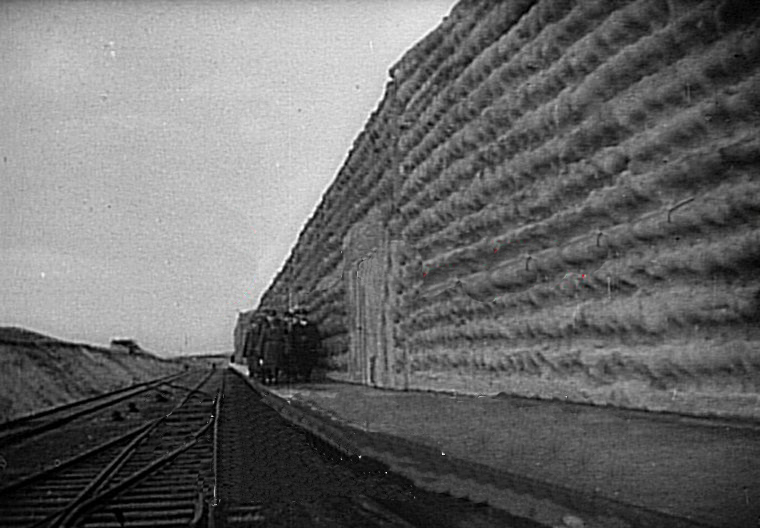 The first storage tunnel on the right with a blown up tunnel to its right. Torpedo on its trolley made ready to load on a bomber. This one and one other we could see had an aerial railway to carry heavy items in and out. Aerial runway to convey torpedoes into the tunnel..
Aerial runway system for shells. A British aerial runway carrying torpedo's at RNAS Gosport. Now turning into the main tunnel, the walls are finished in a very well made concrete surface. You can see the fittings for the aerial runway on the apex of the tunnels roof. Aerial runway fittings in the roof. Fort de Roule, Cherbourg torpedo storage. Then it turns into a very well made brick. PERFORAPERFORA printed onto the bricks. Continuing on. There seems to be no fittings or fixtures, no light sockets or oil lamp niches. Almost as though it was built but never used??? Lamp bunker niche. None of these were her?? Getting closer. The trailer is an old farm trailer and why it needed to be manhandled up the platform and then dragged to the rear of this tunnel I have no idea. I suppose i makes a change from old freezers. They also stored sea mines here. Back to the S bend entrance. The dog leg is to stop or slow down blast if an accident were to happen. Here was a sliding door. A large sliding door closed off the tunnel from the dog leg. Looking out of the entrance. A large double door would have closed the entrance off. There are remains of hinges that have been cut off but when Rommel visited the doors were open. Three heavy hinges were fitted to a steel frame around the entrance. Rommel's visit showing an inwardly opening door with an air vent in it. This is to the left of all the doors. We have no idea what this was, it may have been something to do with ventilation. Ventilation is very important when you store ammunition. Air vent in door by Rommel's leg. A tin shuttered air vent inside in the outer wall. There are three types of front walls. A very odd type of camouflage. A very narrow platform with a steel runner protecting the concrete edge. The platform was cantilevered out from the wall, I did not see any struts underneath it (I did not look too hard) there was also odd niches and air vent slots. Most of this area is now covered by earth pushed in. The next one we entered. This one has the door bricked up and may have been contemporary to the depot or could be post war. Notice the exceptional Finnish to the concrete. Also the brickwork filling in marks on the left arch with the fittings for a sliding door. Again a very good finish to the walls. Two styles of mortar & brick. It looks like a breeze block meticulously cut and fitted in. The end wall with its air ventilation tube. There seems to be no damp at all and the air is very fresh..
A different style of camouflage probably the old empty sacks of cement screwed up and placed into the concrete to create this shape. And it seems there was a fire inside as the walls are all blackened. Also this tunnel seems to have fittings for an aerial runway as well. With the two different types of camouflage and the base of the railway lines. The join between two different styles of camouflage. What looks like a channel between the two tunnel face I think is a gutter space where a rain water down pipe should have fitted. Nothing remains so its all supposition. This is a damaged one between the camouflaged and the earlier none camouflaged tunnels. Boming damage where ammunition is placed in one tunnel and detonated. These six must have been the first to be built and cannot be accessed. During the second world war, the Germans have built here even an important part of the Atlantic wall to a counter an eventual landing in the Pas-de-Calais. It was an ammunition depot giant composed of 44 galleries and tunnels for the convoy of trains of armament. More than 300 Jews sentenced to the work forces and imprisoned a Dannes fulfilled this military complex. All these six are sealed off for bats to live in. Funnily enough its the only graffiti we saw in a sealed off tunnel. This one the last on the right was also blown up for some reason. Looking down into the damaged section of this sealed tunnel. German barbed wire entanglement post possibly still in place after all this time. Looking down at the gutter running the length of the depot. The railway ran from left to tight and linked up with the main line. The tunnels would have continued to the left and some the other side where the settlement tanks now sit. Water would have been needed for the steam trains in large quantities. A French railways/military water tower.